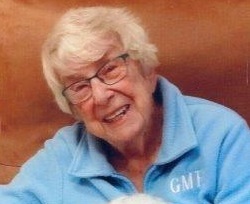 Passed peacefully away in the presence of her family Georgina Mary Eveleigh (Myers) in her 99th year. Predeceased by the love of her life Augustus F. (Gus) Eveleigh (deceased Dec. 1970); and son Robert Walter; sisters May Myers, Anne McLean (Stephen), Stella, (Sr. Mary Egbert Myers), Kathleen Power (James), Clara Kennedy (Rivlyn); and special brother Michael (Mollie). Also predeceased by her husband’s family with whom she had a special relationship. Leaving to mourn daughters Gloria Sellars (Rev. Dr. Clarence) and Rosalind Foley (Ben); five special grandchildren who she adored: Charmaine (Mario Bali) and Jennifer Foley (Martin Vallee), Lisa Sellars (Shawn Hemens), Christopher Sellars (Jacqueline Lubino), Robert Sellars (Marie Louise Ahern); eight adored great grandchildren: Christoph and Joshua Sellars, Shaunessy and Quinn Hemens, Liaam and Gil Ishaky and Zoe and Anasophie Vallee; wonderful and very devoted nephew “son” Hubert Power, and special nephew Wayne Eveleigh; many dear nieces and nephews and lifelong loving friends; very caring friend Sandra Dray and other friends and staff of 4NE Pleasantview Towers with whom she shared her last several years. Resting at Carnell’s Funeral Home, 329 Freshwater Road, on Tuesday, December 13 from 2-4 & 7-9 p.m. Funeral service will take place on Wednesday, December 14 at 2 p.m. from Topsail United Church. Cremation to follow with private interment in Clarke’s Beach. Flowers gratefully received or memorial donations may be made to the Stella Burry Foundation. We are so sorry to hear of Georgina’s passing. I have very fond memories of her from when I lived in Newfoundland. She was a very wonderful and wise lady. Sincere condolences to Ros, Gloria and families. Condolences to the Eveleigh family on the loss of your Mother. She was a special lady and will be fondly remembered. I was very saddened to hear of Georgina’s passing. She is the last of that part of the Myers family.to which she contributed a great legacy. My thoughts and prayers are with you as you mourn and celebrate a great life. We are thinking of you and holding you in our hearts and prayers. Gloria, Rosaline and family: So sorry to hear of your mom’s passing. I had visited here only last week and had a good chat. She loved you girls and spoke of you all frequently. Gods Speed. She was an amazing lady with a forever memorable personality. Rosalind and family, thinking of you today praying that you will find strength. We remember your mom fondly. Lorraine and George Jarvis. To the family of Mrs. Eveleigh; Extending my deepest sympathy to the family on the passing of such a gracious lady. I’m sure you have lots of good memories of her. Keeping you in my thoughts and prayers. My condolences on the loss of your Mom. Myself, J.J. and Mom thought a lot of Georgina and she was a great friend to Mom. She was so kind to all of us. I will miss her at the dinner table. Sorry to hear of Mrs. Eveleigh’s death. She was such a gracious person who had the ability to inspire others with every conversation. A life well lived. You are in our thoughts and prayers as you prepare for the celebration of her long and wonderful life. God bless. We are deeply saddened by the loss of our Dear Aunt Georgina but pleased that we took the time to visit her each time we visited the province the latest being this past September. member of the huge Myers family. Our thoughts and prayers are with you all as we recall the wonderful span of years that we had her and in relatively good health at that. Now, herself and Uncle Gus can fill in all those years that they have been apart.